Up until a short time ago, I had never heard of Wadi Rum. It wasn't until travel blogger Gary Ardnt mentioned it in one of his posts a year ago that I was introduced to it. Wadi Rum sounded extremely remote and exotic and not knowing much about the Middle East, I knew I had to get there one day. When the Jordan Tourism Board invited us to come and see their incredible country, we finally had our chance. We started our day off with a 4X4 adventure through the desert beginning at the Wadi Rum Visitors Centre. an imposing rock formation named after the autobiography by T.E Lawrence of the same name. As the main jumping off point for tours out to the desert, the visitors centre is a bustling place. A group of men invited us over to have our picture taken and one of them even offered to be our photographer. We enjoyed talking with them and unlike many other places in our travels, they never expected anything in return. 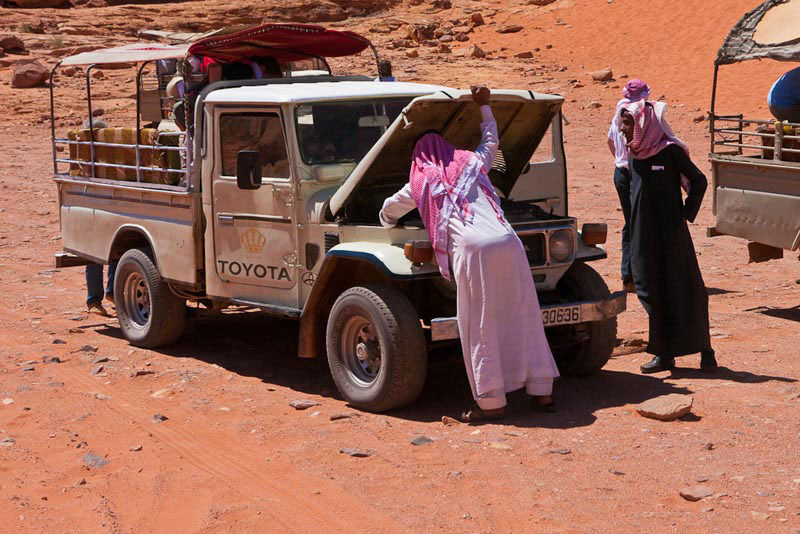 Once we had everything in order and said our goodbyes we joined our guide for our very own 4X4 tour of Wadi Rum. It's not only a scenic tour of the desert but a fun adventure riding in the back of a truck over bumpy terrain. As it was everywhere in Jordan, the landscape of Wadi Rum was astounding. Our driver told us to rap on the truck's roof whenever we wanted to stop for a photograph and we ended giving our knuckles quite the workout. We constantly wanted to take a closer look or picture at every turn. It was the famous Rock Bridge of Wadi Rum that was our first “official stop” of the tour. This is the photograph that everyone wants to get. Overrun with tourists when we first arrived, we patiently waited for the clamorous group to finish up before making a run for our own shots. We had exactly 10 minutes to grab our pictures before the next wave of tourists came through. And we are happy to say that we accomplished our mission. It was now time to move onto our next stop, the Khazali Canyon. 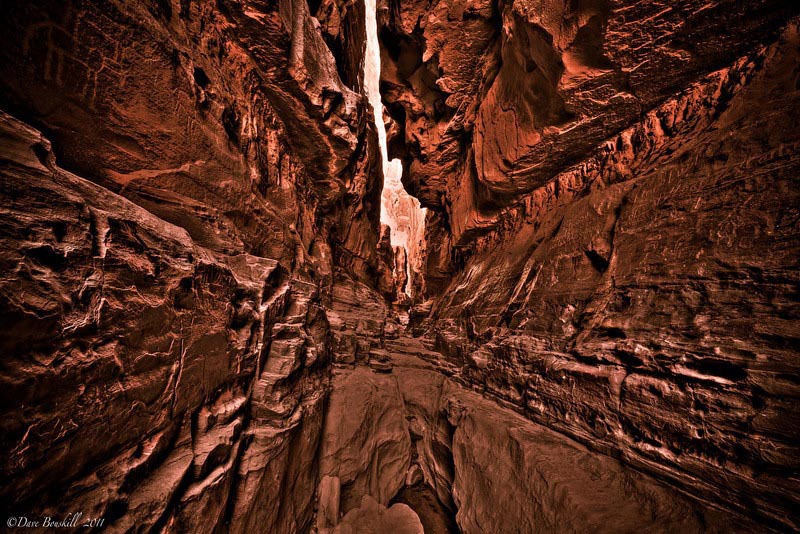 This is a small but fascinating canyon filled with Nabatean inscriptions dating back to the 4th century BC. 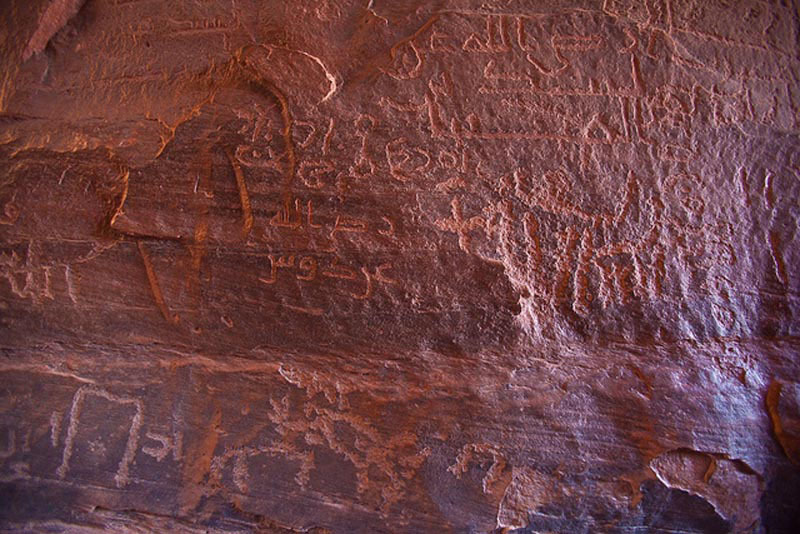 Our guide Ali explained to us that he can read these inscriptions as they are an ancient form of the Arabic language. I thought that was pretty cool, but then again, he never did explain what the inscriptions said. I am captivated by ancient carvings and structures. 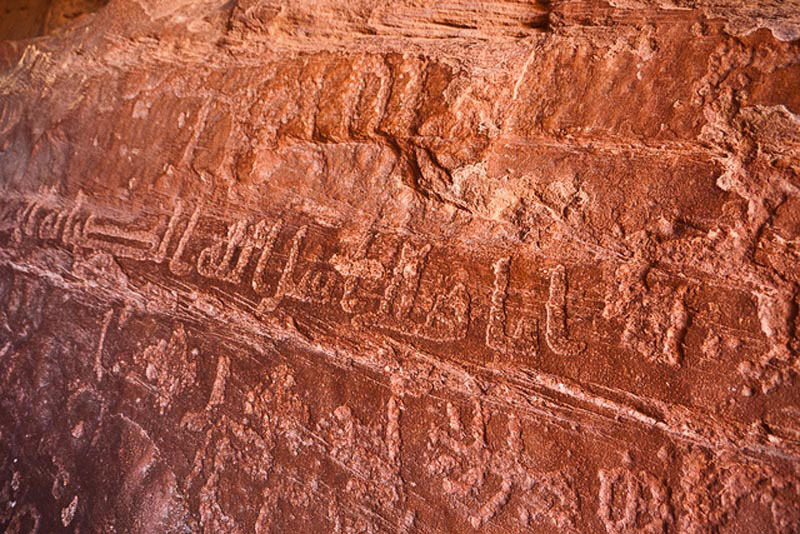 How can these inscriptions last for thousands of years when the entire landscape has changed over time? Erosion and wind should have wiped them away and yet here they are. While the inscriptions are impressive, it is the walk farther back into the cave that is jaw-dropping. We couldn't believe when another group coming in asking us how long of a walk it was to the back of the canyon. When we replied about a minute, they decided to turn around and head back out. Curious. After our glimpse into history and our walk into the spectacular display of nature at its finest, we needed a refreshment. 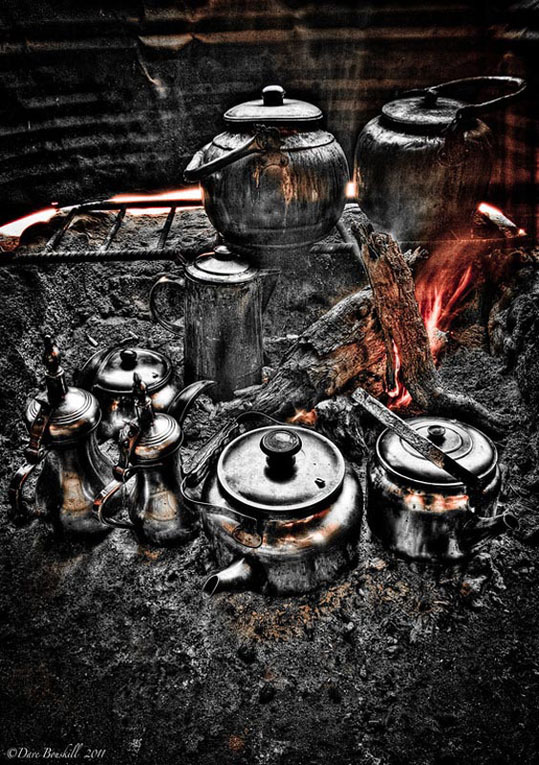 Acting like true Bedouins, we walked through the sand to a nearby camp where we sipped on sweet and spicy tea. The Bedouins drink their tea with a lot of sugar and we followed suit. They explained that they do not have a lot of sweets in their diet and the tea satisfies that craving. Known as Bedouin Whiskey you will be served tea wherever you go in Jordan and we developed quite a taste for it. We love this tea so much that we bought two packs to bring home to keep a little bit of Jordan with us. It was one final quick stop at the red sand dune before heading back to the Visitors Centre. This is where we finally caught up with the rest of the crowds and where we opted out of hiking up to the top to join the throngs of people. Instead, we were captivated by the guys trying to fix their jeep. Sometimes it's the oddities in life that are more enthralling than the stunning landscape in front of us. It seemed so surreal to have these men dressed in traditional garb working on a carburetor in the middle of the mystical Arabian Desert. Wadi Rum may be overrun with tourists but it is worth visiting. If you have more time, I would suggest going on a longer jeep safari or camel trek. Like everywhere on earth, it is becoming more difficult to get off the beaten path. But if you work a bit harder and travel a bit farther, you will travel away from the crowd and quite possibly will find yourself among the true Bedouin of Wadi Rum. For a different Experience, try seeing Wadi Rum from above by Ultralight or Hot Air Balloon. 10 Exciting Things to do in Jordan right Now! 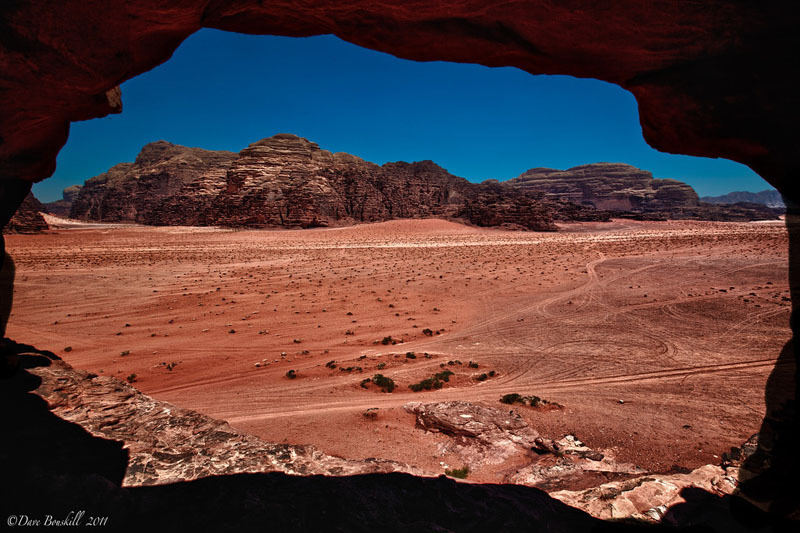 24 Responses to "Wadi Rum a Bedouin Experience"
Absolutely stunning photographs, my favorite one is the rock bridge for the location and the picture following it for the composition. Perhaps you could run a tutorial on HDRs some day?? 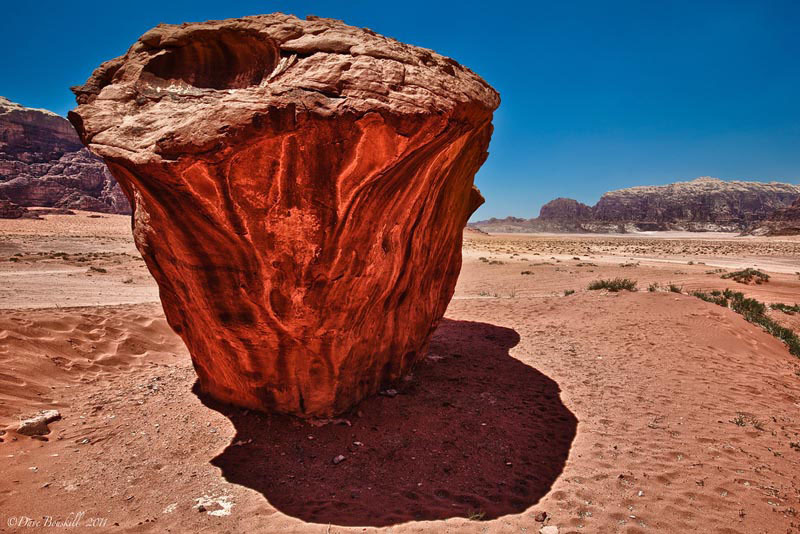 Well done Dave, Wadi rum is a great place for photos. Wish I would have had more time there, and better times of day to shoot in. It would be nice to do a 1 week trek in Wadi Rum all on Camels, and camping out in tents would be nice too. Hopefully one day I’ll get the chance to go back to explore a lot more of what Wadi Rum has to offer. Wadi Rum does look beautiful. I really like the colors of the rocks and sand. It makes for a very unique landscape that is beautiful in its own right. Thank you for sharing another great tale Deb, really quite disappointed I missed out on the chance to visit Jordan when I was in Egypt last year, hoping that will be a mistake that is not regretted for too long. I am not a great tea drinker but have to agree that the mint tea drunk throughout this part of the World is exceedingly welcome whenever it is offered. I even have it instead of coffee sometimes!!! 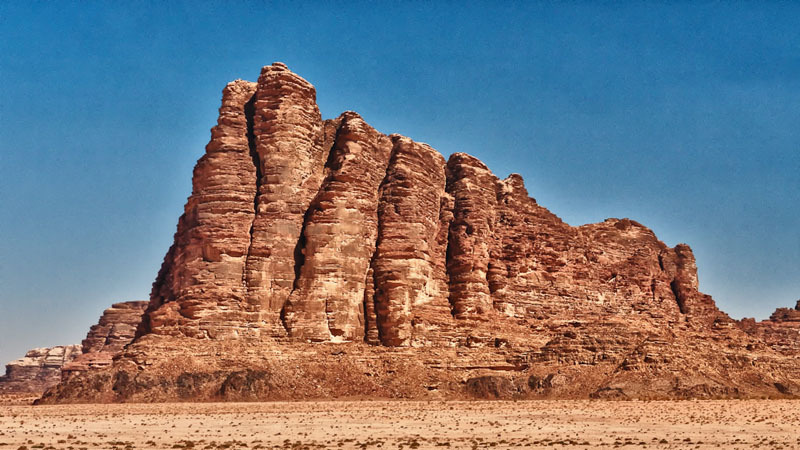 Wadi Rum is one of those evocative names that inspire people to travel often without even seeing a picture, my determination to see it one day is even more resolute now. I hope you make it there too. We went to Egypt in 2008 and felt the same way. We wished that we could have ventured over to see Petra and more! It only took us three years to make it back to this part of the world. how do you post process you pictures? I like that third one, looks like burning rock. Hi Marwan, Thanks for leaving your information. I will check out your facebook page. Everyone is always so very helpful and friendly in Jordan. How awesome! Definitely jealous–looks like an amazing place. Looking forward to reading more! I saw your comments on Jordan and had to reply! I am EX-pat American who has lived in the Middle East (and other places in the world) for a couple of years and I love it. Jordan has to be top on my list in the region, it has so much to offer and really nice people. I have recently opened a Tour Comany in Jordan called Discover Jordan with a group of other expats. We specialize in Eco-tourism, hiking and classic advernture tours/trips. Look forward to seeing you in Jordan soon! Thanks for sharing Laura. Good luck with your business. We love Jordan too. Hi Christine, hopefully you will make it there soon. Wait until we post our Wadi Rum at night article. It was amazing camping in the desert. Jordanians are among the friendliest people in the world, aren’t they? Haven’t made it to Wadi Rum yet, but it’s high on my list. Beautiful photos here. Great photos! Wadi Rum is like no other place on Earth, Jordan is an amazing country with such friendly people. 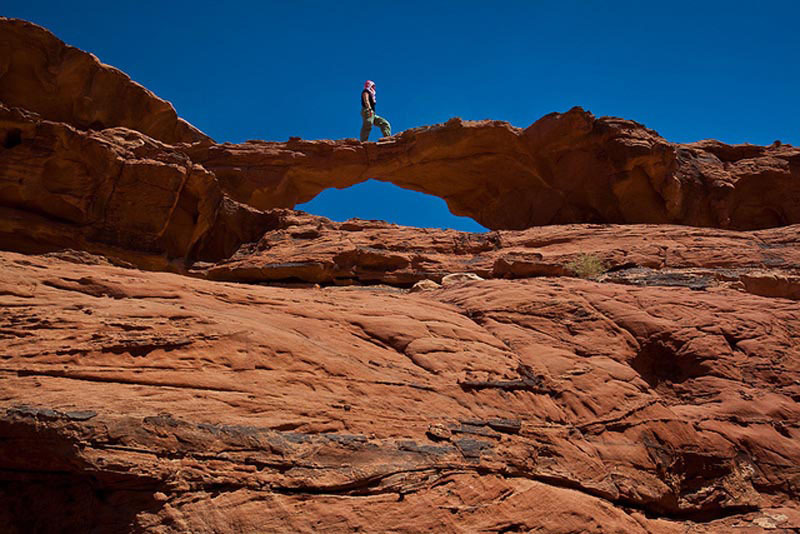 For anyone who loves adventure, outdoors and hiking Jordan has it all. Not to mention Dead Sea & Red Sea…. It’s a must!! You are right Laura, there is so much to do in Jordan. It is a stand alone destination i the Middle Est. Yes they are Sophie. Wadi Rum is a beautiful place. If we had more time, we would have taken our own advice and gone further out into the desert. That is the wonderful thing about a sponsored trip though, we get to sample the best of the country and make our list of what to see when we come back.